The Little in Japan book is now on sale! The book collects all the Little In Japan comic strips so far, with a few new pages thrown in. It’s available as a 100-page paperback, or as a Kindle book. “Big in Japan” – Despite the cliche, not every westerner who arrives in Japan is greeted with immediate and massive success. For every overnight star who hits the big time in Tokyo, there are countless ordinary slobs floundering in the suburbs, teaching English. 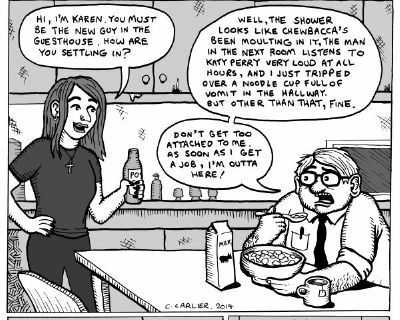 This comic is about one such person. 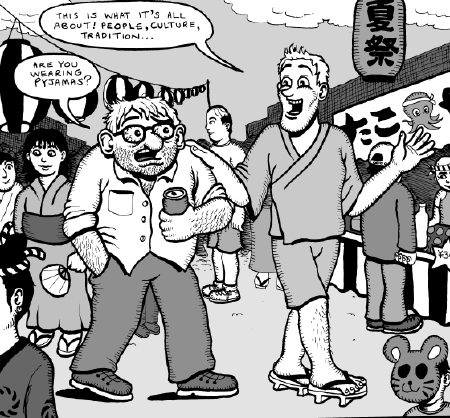 Dave Barker is a bumbling ex-pat who loves Japan, and in order to stay must reluctantly teach people how to communicate in English, despite having inept conversational skills himself. Follow Dave as he tries to get by but fails at every turn, inadvertently offends Japanese sensibilities, and just generally makes a fool of himself. Little in Japan is available on all the Amazon sites internationally. You can read the full strip here. 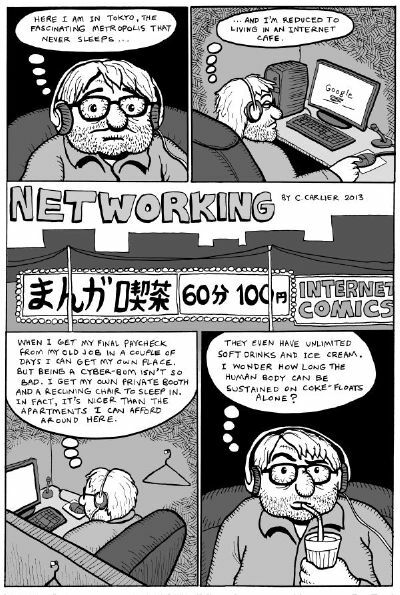 In the latest Little in Japan comic strip, Dave tries his luck at various non-teaching jobs in Japan, without much luck. It was a nice chance to commiserate with (and poke fun at) my fellow Tokyo creatives, who say they are in bands or writing novels, but are all secretly teachers. I thought about the characters from New Horizon, and what they would be like 10 years later if they fell on hard times. In my version of the book, the character Mike is homeless, Emi is a prostitute and good ol’ Ann Green sensei is a suicidal hostess. They have rude conversations and Japanese can learn some very rude English insults. 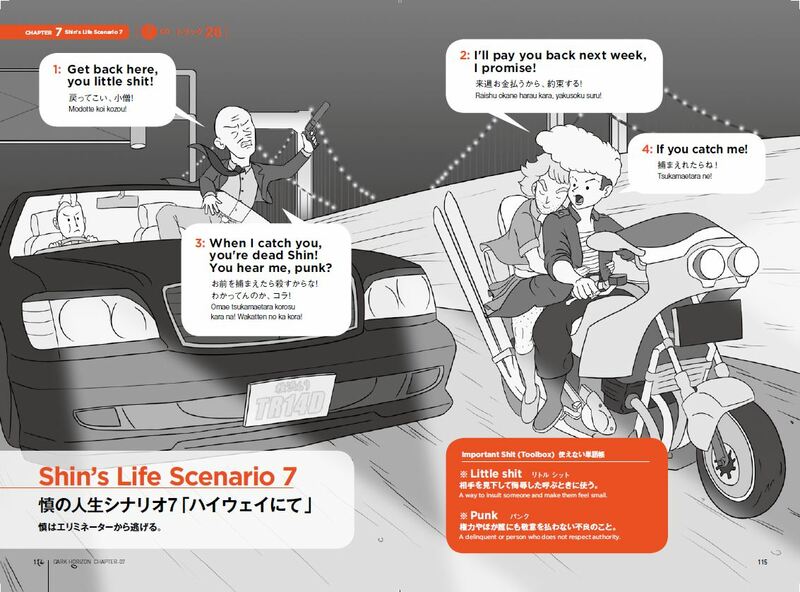 I included Romaji in the book, so it works well for English speakers to learn naughty Japanese phrases too! It’s a hilarious, irreverent read. You can get it in Amazon and lots of Japanese shops. 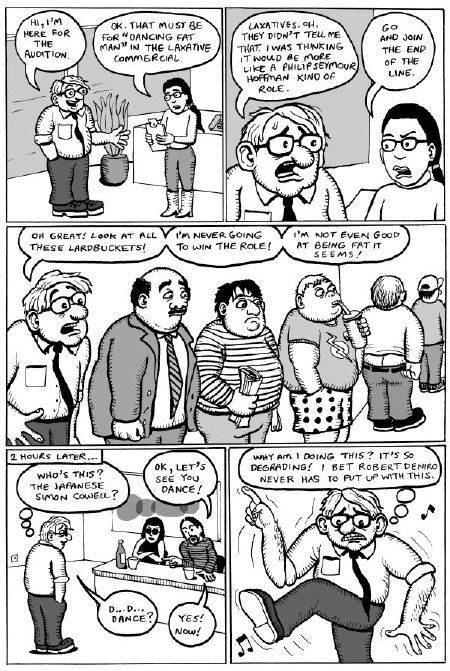 Dave’s downward spiral continues as the comic strip returns for the first time this year. This time he is exploring his unappealing career options. I’ve just completed the first “Little In Japan” strip in ages. Stranded in a cyber-cafe, Dave experiments with social media, and gets into more trouble. The latest Little in Japan strip has arrived. In the new story Dave takes up blogging and disgraces himself at a summer festival.